It was about 6:30 PM yesterday evening as I stood in our kitchen asking myself the million dollar question: “What’s will I eat for dinner tonight?” After about 10 minutes of standing in front of the fridge wishing a meal would appear I decided that cooking was inevitable and there was simply no way around it. No not tonight 😦 The humidity was high and I needed something quick and simple. Less than five minutes later I had rounded up 4 russet potatoes, 1 medium onion, 2 gala apples, an ear of leftover corn and a bag of dry grits. Yup this was the makings of a breakfast for dinner kind of a meal. What did I create with these 5 star ingredients you ask? Home Fries, Grits and Fried Apples of course. My breakfast for dinner aka poor man’s meal on a dime was complete. The star of this less than 30 minute meal were the deliciously sweet sauteed apples. These apples are perfect as a side or served over warm sorghum pancakes or even better sorghum biscuits. 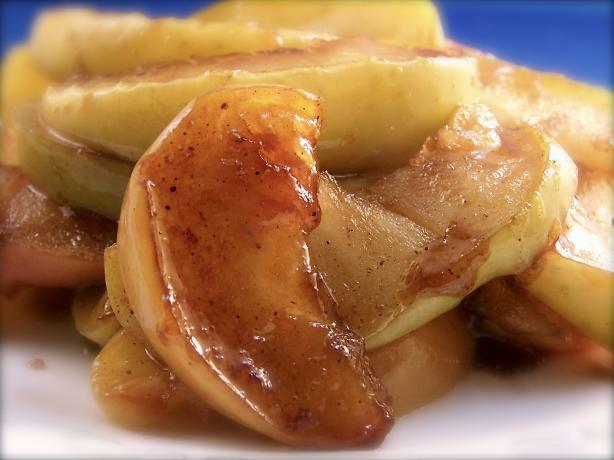 The best thing about this recipe is that it works with any kind of apple you have on hand. I surmise that granny smith would be the perfect blend of tart and sweet. Maybe I’ll use them this weekend? But enough of my ramblings and digressions get into the recipe below! In a small saucepan melt vegan margarine over medium heat. Add apples and water and sauté on low heat until apple are tender, about 6-7 minutes. Reduce heat to low. Add brown sugar, and vanilla cover and cook down another 3-4 minutes. Turn off heat and allow to sit an additional 1 minute. Serve warm over gluten free biscuits or pancakes top with cinnamon.